18. Oxygraphis Bunge, Verz. Altai-Geb. Ges. Pfl., Mem. Acad. St. Petersb. 46. 1836. Hook.f. & Thoms. in Hook.f., Fl. Brit. Ind. 1:21. 1872, Ovezinnikov in Komarov, Fl. URSS. 7: 325-328. 1937. Perennial with basal leaf-ros ettes and stem leaves or leafless scapes. Flowers either solitary or several, peduncles arising from the axils of ± crowded involucre l ike leaves. Sepals 5, sometimes coriaceous, persistent after flowering and embracing the fruiting head. Petals 5-15, oblong to linear. Stamens numerous. Carpels numerous, forming a subglobose to ellipsoidal head, usually with longitudinal veins and an acuminate subulate ± upright beak. About 6 species in Europe, C. & E. Asia and Arctic Siberia. Represented by 1-2 species in Pakistan. The genus has been merged into Ranunculus by nearly all the authors dealing with European plants, Wh ile it has been more generally accepted for the Asiatic floras. This is due to the fact, that only one well-known, circumpolar arctic alpine species, Oxygraphis vulgaris (= Ranunculus glacialis L.) is found in Europe. At present, the delimitation of Oxygraphis is not quite clear, as not all the characters regarded as decisive are found in all the species included by one or the other author. The most important distinctive character seems to be the persistent calyx. Oxygraphis polypetala (Royle ex D.Don) Hook.f. & Thoms. Oxygraphis shaftoanus Aitch & Nemsl. Oxygraphis glacialis auct. non Bunge: Hook.f. & Thoms. = Oxygraphis polypetala (Royle ex D.Don) Hook.f. & Thoms. Ranunculus polypetalous Royle ex D. Don = Oxygraphis polypetala (Royle ex D.Don) Hook.f. & Thoms. 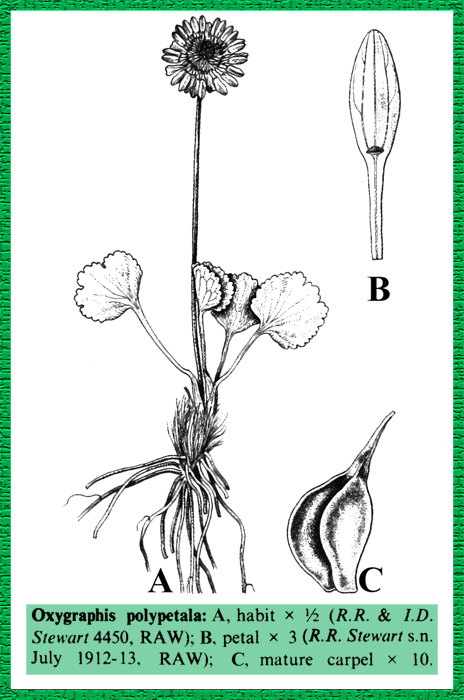 Ranunculus royleanus Qureshi & Chaudhri = Oxygraphis polypetala (Royle ex D.Don) Hook.f. & Thoms. Ranunculus shaftoanus (Aitch. & Hemsl) Boiss. = Oxygraphis shaftoanus Aitch & Nemsl.